After more than twenty years as master and commander of merchants vessels between London, Sydney, NSW and Hobart, Van Diemen’s Land (Tasmania), Captain Edward Goldsmith (1804-1869) retired to his ancestral estates at Chalk and the house at Gad’s Hill (variations eg. Gadshill, Gads Hill), Higham, Kent, UK. Within months of resuming residence at Gad’s Hill House in mid 1856 with his wife Elizabeth Goldsmith nee Day, and son Edward Goldsmith jnr,, he was the subject of a curious threat about the lack of water to the house of his new neighbour Charles Dickens down Telegraph Hill at 6 Gad’s Hill Place: “Goldsmith or I must fall, so I conceive”, Dickens avowed in a letter to Henry Austin on 6th June 1857. 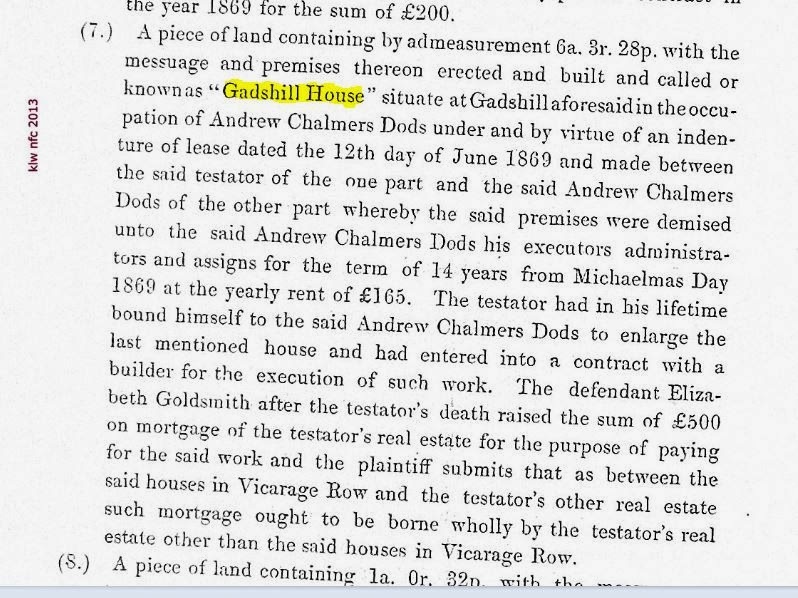 By 1869, Gad’s Hill House was listed in Captain Edward Goldsmith’s will as leased to Mr Andrew Chalmers Dods on a piece of land measuring 6a, 3r, 28p which was undergoing extensions and enlargement, payment for which was to be executed out of the Captain’s other estates, excluding Vicarage Row which he desired to be left to his nieces Elizabeth Rachel Nevin (nee Day, wife of photographer Thomas J. Nevin), and her younger sister Mary Sophia Day, residents of Hobart, Tasmania. 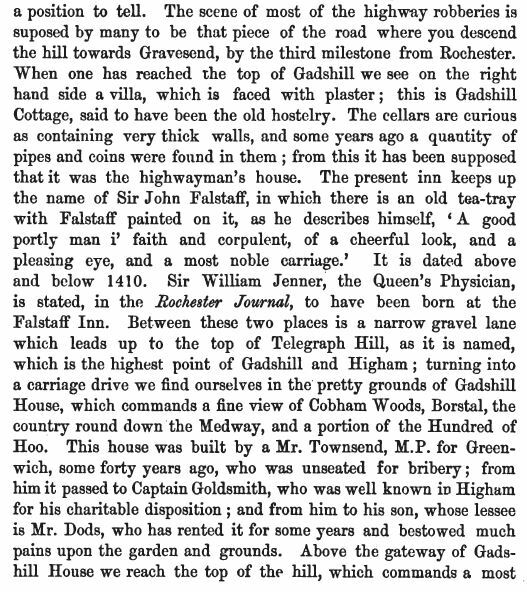 Originally named Mount Prospect, Gads Hill House was located at the top of Telegraph Hill with commanding views of the Medway and Thames to the north and Cobham Hall to the south west, hence Charles Dickens’ description of it as “that crow’s-nest of a house” (see letter below). Outside the gates was a beacon and a ship’s bell on a metal stand at the front door. Although Captain Goldsmith was one of the first owners of the house, if not the original owner in 1825, Mr John Townsend, MP for Greenwich and a Shakespearian actor of note ca. 1842, was thought to reside there. Captain Goldsmith’s generosity in easing Townsend’s considerable debts, among other acts of kindness in the district for which the Captain was known, was mentioned by Cecil Fielding in 1882 on page 7 of his publication, A Hand-book of Higham: Or the Curiosities of a Country Parish. Gads Hill House, near Rochester, Kent. A long, sweeping drive, six bedrooms, magnificent full-length hall, huge reception rooms – what more could a City commuter want in a country residence? Land? There are more than four acres of woodland and gardens, including a croquet lawn and orchard. Somewhere to lay down the claret? There are three cellars and a wine store. And with regular commuter trains from Higham, two miles away, to London, you could still be back to bath the kids. 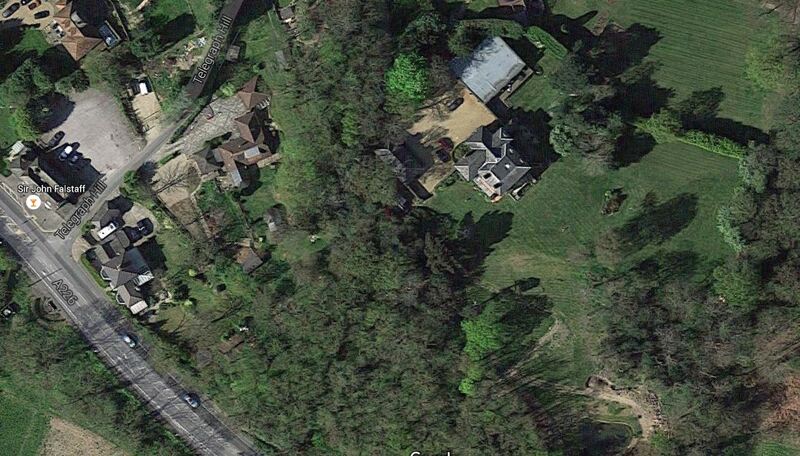 In 2009,Gads Hill House Telegraph Hill, Rochester, Gravesham, Kent, ME3 7NW was the most expensive house purchase in Telegraph Hill, sold for £1,395,000. What remains of Captain Goldsmith’s property at Gads Hill. 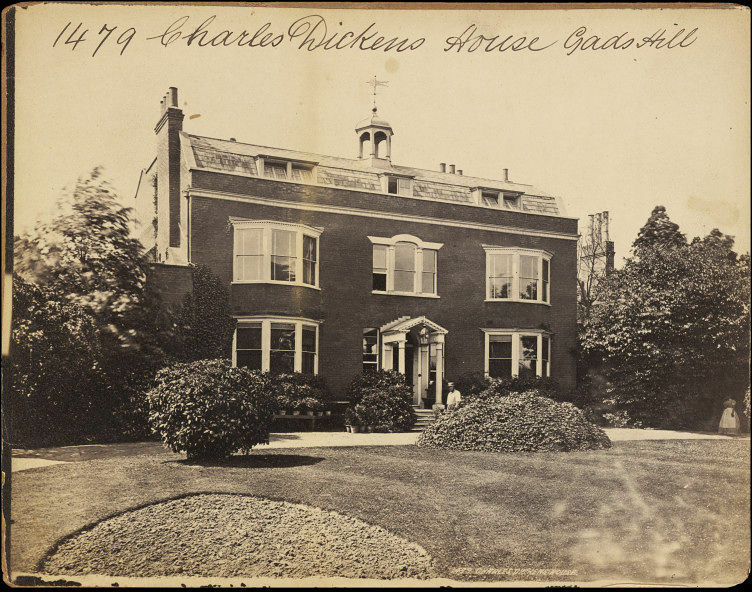 When Charles Dickens (1812-1870) settled finally into the house at 6 Gad’s Hill Place, Higham, Kent (UK) in 1857, his attention was drawn to Captain Goldsmith up at Gads Hill House on Telegraph Lane on two most urgent matters – the water supply to his house and the location of the village mail box, both of which Captain Goldsmith seemed to monopolise. though I may, perhaps, let it afterwards, furnished, from time to time…. gallons? Goldsmith or I must fall, so I conceive. GAD’S HILL PLACE, _Saturday, Aug. 15th, 1857. Thursday, and then to go to Manchester until the following Tuesday. I send this by hand to John, to bring to you. 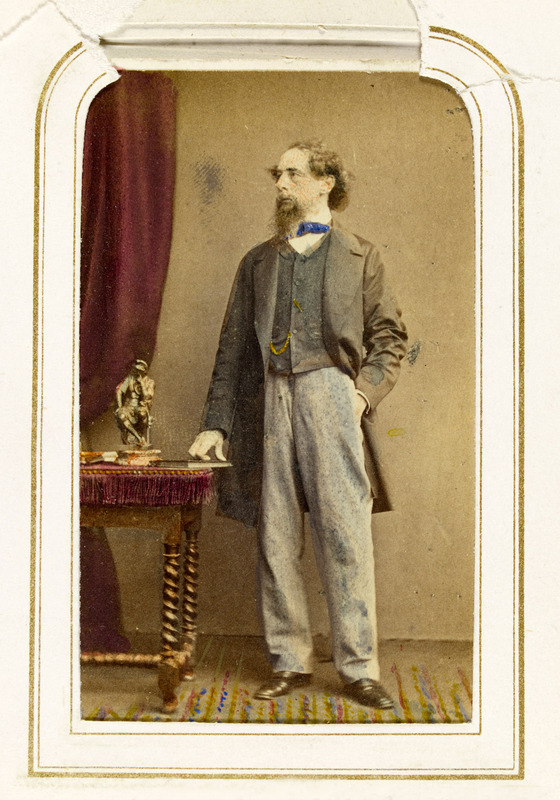 Charles Dickens and Captain Edward Goldsmith were well-acquainted, even on close terms, despite Dickens throwing down the gauntlet in a letter to Henry Austin on 6th June 1857, avowing “Goldsmith or I must fall, so I conceive“. 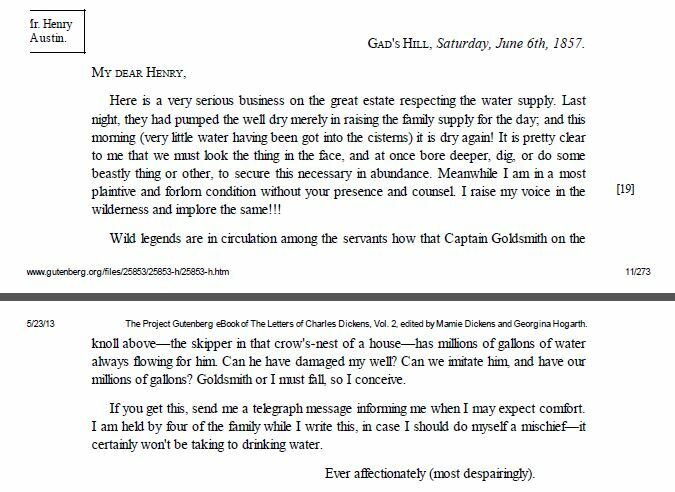 Dickens would have approached Captain Goldsmith as soon as he realized he had a problem supplying water to his new purchase at 6 Gad’s Hill Place. Captain Goldsmith was knowledgeable about springs, bores, pipes and pumps; his own household enjoyed “millions of gallons“, as Dickens complained at the time. Only a skipper of great merchant and passenger ships at sea for months on end would understand pumps, not to mention 20 years’ experience on the driest continent on earth, the Australian colonies, where bores provided the only solution to endless drought. And as a shipyard and patent slip operator, he was handy with machinery. Dickens would have welcomed his assistance as one of his “friends” who had overcome the problem with a bore by July and promised him “a ton a minute for yourself and your family, sir, for nevermore” (letter to Henry Austin, 15th August 1857). The water table at the top of the hill was very high and the cellars of the house regularly flooded. The strange thing was that they only flooded in times of drought not in times of very wet weather. I researched it and there is a suggestion that in drought times they stopped pumping from Higham marshes and this somehow caused the water table to rise at the top of the hill. 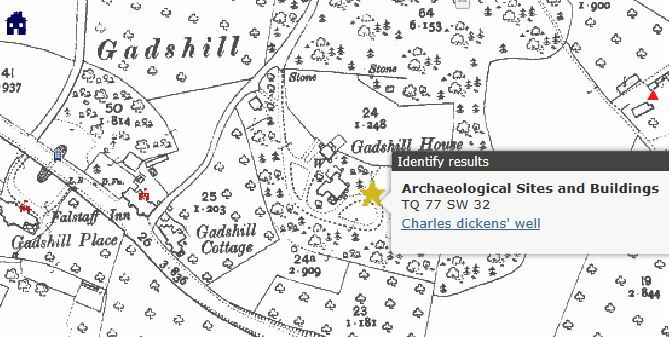 Presumably properties at the bottom i.e Dickens Gads Hill Place would have had empty wells. There were three wells at Gads Hill House and they were always full….as was the cellar for a good deal of the time! as once flooded the water did not drain away for a very long time. Suddenly in the middle of a very hot summer I would go down to the cellar and find it flooded…quite bizarre. 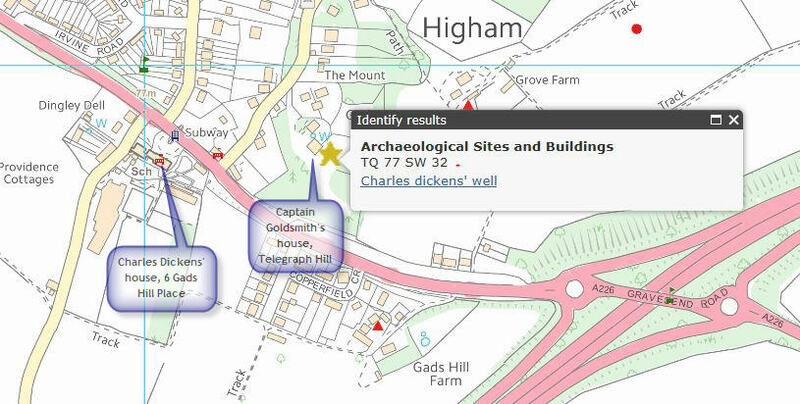 Kent ordnance maps from 1871 to 2005 online show a curious anomaly about the Gads Hill location of Dickens’ well: they indicate that the archaeological site of the well, and a monument erected there to identify it, is or was within the grounds of Captain Goldsmith’s property, Gadshill House on Telegraph Hill rather than further down the hill, within the grounds of Dickens’ property at Gadshill Place on the Gravesend Road. The ordnance map software pinpoints it with the yellow star on these webshots (below). Perhaps there is or was a monument purporting to be the site of Dickens’ well located up Telegraph Hill inside the grounds of Gad’s Hill House, mistakenly placed where Captain Goldsmith’s own well was located, at some point during the early 1900s when so many buildings in the area were marked out and identified with an association to Dickens’ life and novels for the many tourists following the thematic walking trails. But being inside private property. this particular monument has either been removed, if it ever existed there, or is no longer accessible to the public. [TQ7125 7088] The well-house stood on one side of the new stable yard at Gadshill Place next to the new stables which Charles Dickens built, now converted into classrooms for Gad’s Hill Place School. 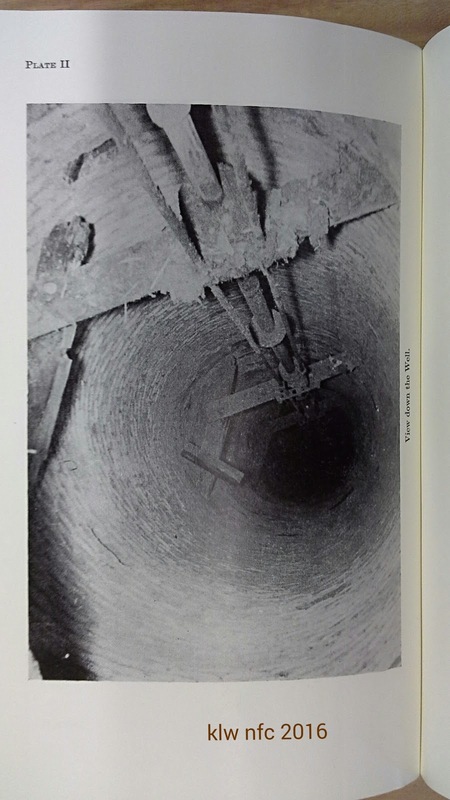 The well itself was of great depth, variously given as 230ft and 217ft and was dug through the bed of Thanet sand deep into the underlying chalk. It was still in use in 1888 but seems to have become redundant about 1900 when mains water reached Higham. 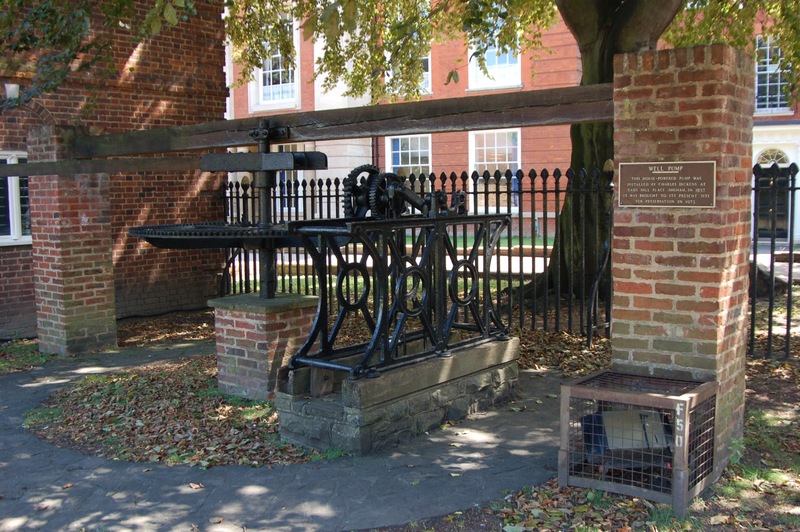 In 1973, the well pump was relocated to the grounds of the Charles Dickens Museum at 48 Doughty Street, London WC1N 2LX. 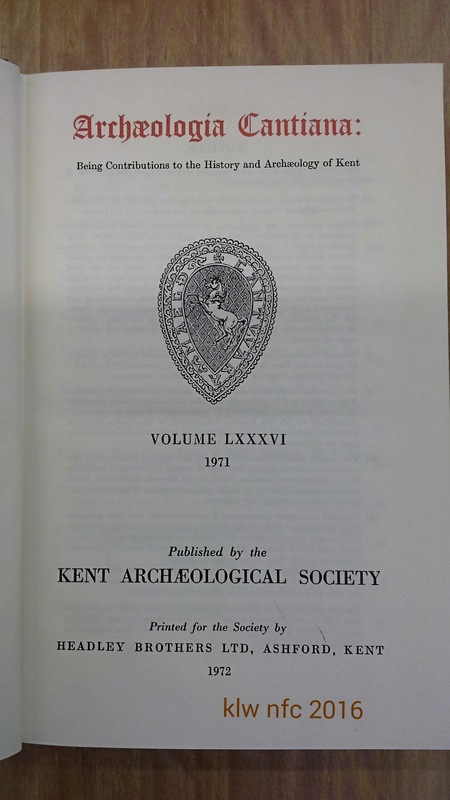 An article published in 1972 , written by A. C. Harrison and J.E.L. 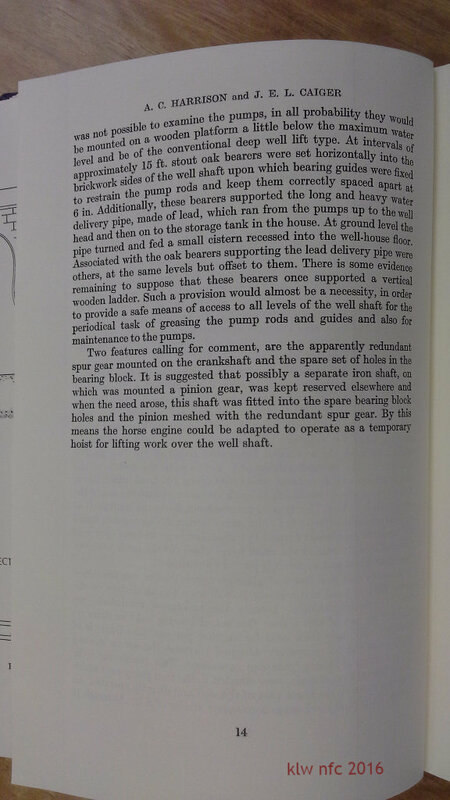 Caiger, titled “Charles Dickens’s Well” (Archaeologia Cantiana, Volume LXXXVI 1971, pp 11-14), describes in detail the trouble first encountered by Dickens with the water supply to the house and the well’s construction (after the account by Dickens’ contemporary John Forster); the well-house; and the horse engine driving the pump machinery. 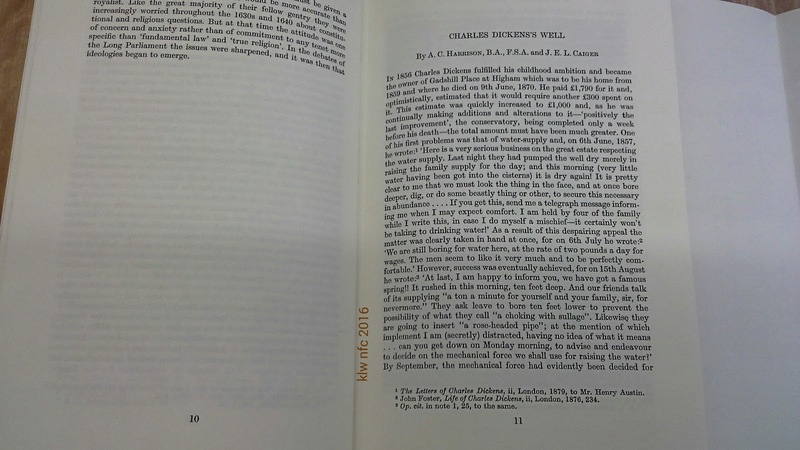 The authors mention a traditional tale that on the completion of the well, Dickens was convinced that the then Master of Watt’s Charity in Rochester had dumped the body of a dead cat into the well which he later retrieved. 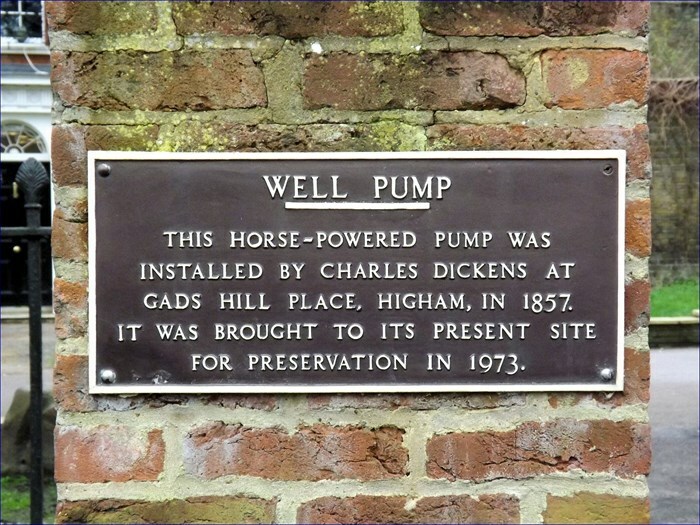 The original location of the well is identified by these authors as standing on one side of the stable yard next to the new stables at 6 Gad’s Hill Place which Charles Dickens built, a square building with a beamed and tiled roof. The well reached a depth between 217ft and 230ft. In 1957 the structure of the well-house was deemed unsafe and demolished. 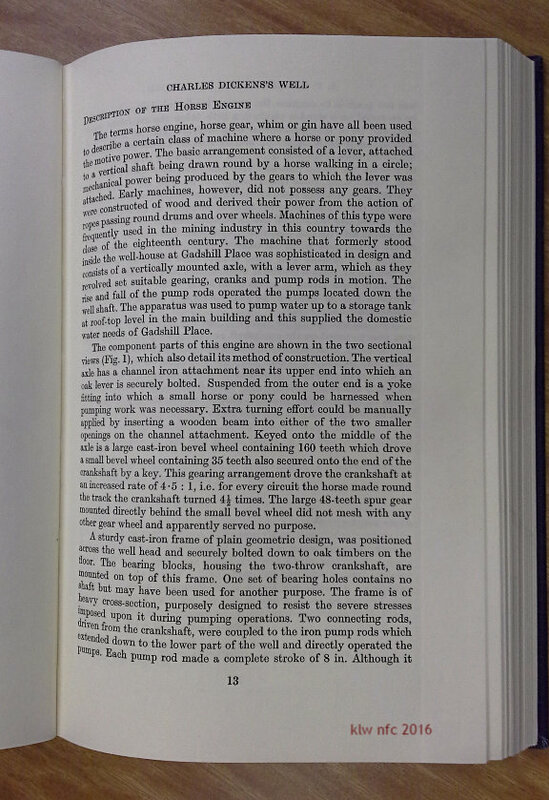 The terms horse engine, horse gear, whim or gin have all been used to describe a certain class of machine where a horse or pony provided the motive power. 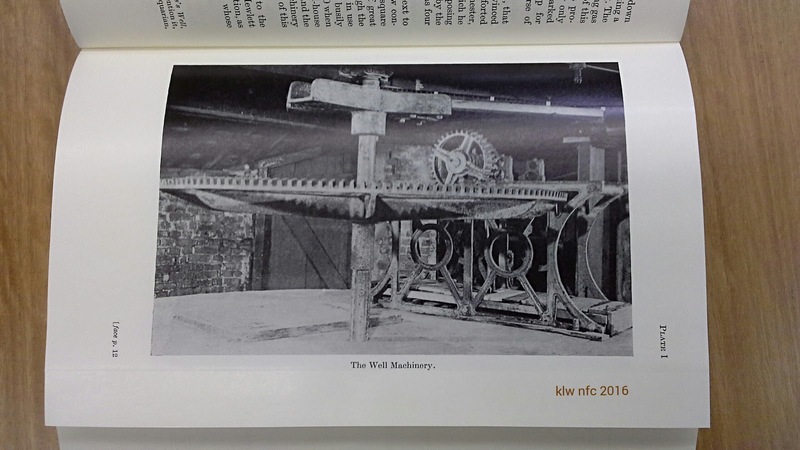 The basic arrangement consisted of a lever, attached to a vertical shaft being drawn round by a horse walking in a circle; mechanical power being produced by the gears to which the lever was attached. Early machines, however, did not possess any gears. They were constructed of wood and derived their power from the action of ropes passing round drums and over wheels. Machines of this type were frequently used in the mining industry in this country towards the close of the eighteenth century. 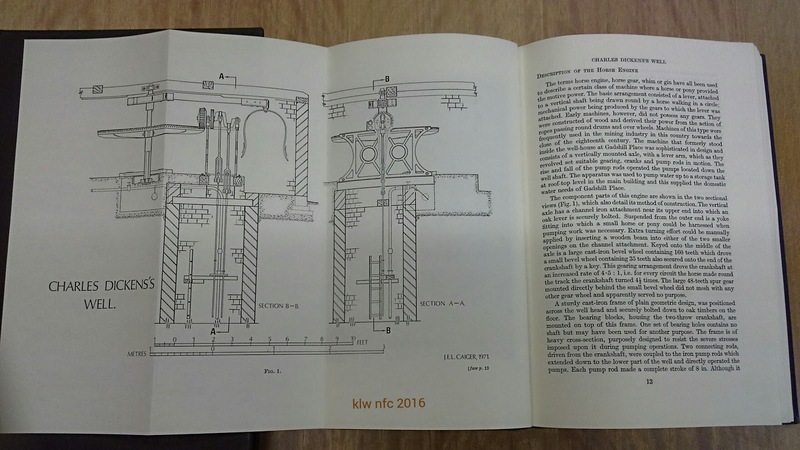 The machine that formerly stood inside the well-house at Gadshill Place was sophisticated in design and consists of a vertically mounted axle, with a lever arm, which as they revolved set suitable, gearing, cranks and pump rods in motion. 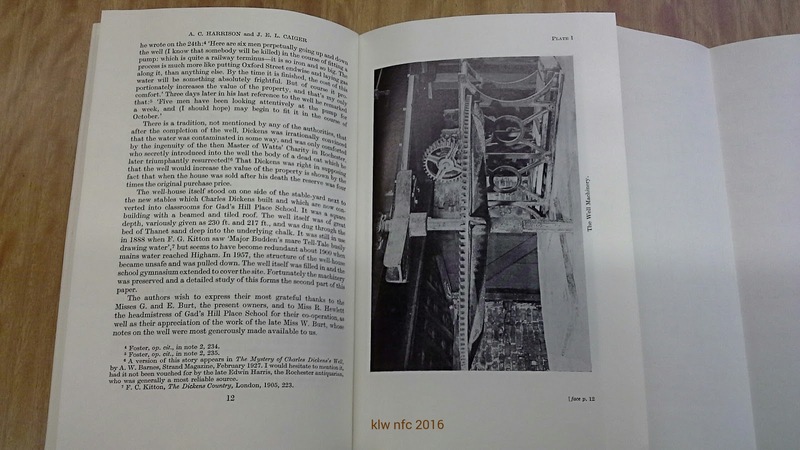 The rise and fall of the pump rods operated the pumps located well shaft. The apparatus was used to pump water up to a storage tank at roof-top level in the main building and this supplied the water needs of  Gadshill Place.